…. 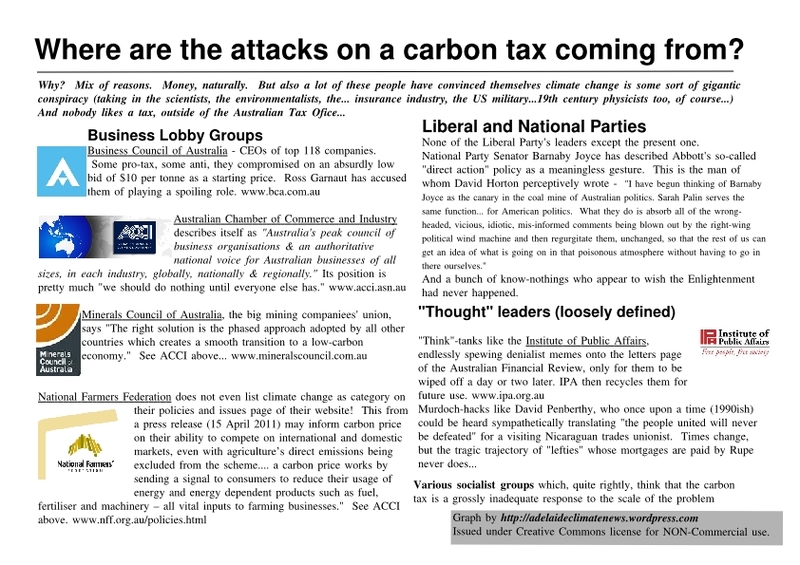 you forgot to mention the 68% of Australian voters who are against the Carbon Tax. Guys. It ain’t gonna fly. Maybe, maybe not. You do know that there’s a Labour government, right? You do know that two of the crucial independents (three if you count Bandt) are on the MPCCC (I did a bluffer’s guide on that, if you need). You do know that legislation gets through the lower house without being submitted to a referendum? Did they cover that in your civics class (when they weren’t teaching you about apostrophes on plurals)? You know that the Greens are going to hold the balance of power in the Senate as of July 1st? So, the Tax is unpopular. What tax isn’t? Was the GST (which I pay just like you do) popular? If it gets through the two houses of Federal Parliament (see above) then the BCA will come on board, and other outfits will adjust to reality – I am sure they’ve done their costings. Now, of course, the government might fall before the legislation goes through, in which case, you’re right, it “ain’t gonna fly”. But if the government doesn’t fall, then I suspect we are going to have a Carbon Tax. It remains to be seen – you have no grounds for certainty. And, of course, a carbon tax is only a very very VERY small part of the solutions. But you surely know that, don’t you.